In the last couple of articles of this price action course, we began learning about multi-candlestick patterns. In this article, we will learn about trading the morning star candlestick pattern – our first three-candle pattern. 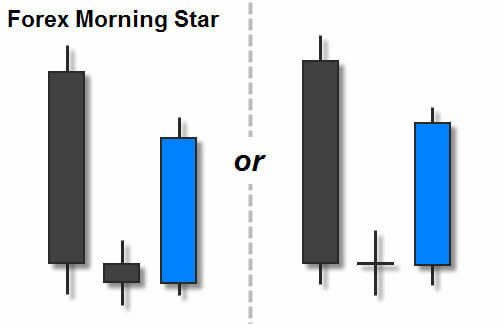 The morning star candlestick pattern is considered to be a fairly strong price action reversal signal. Many traders find this pattern reliable enough to consider it their favorite trading setup. At the same time, many price action courses leave this candlestick pattern out altogether, because it can be tricky to qualify. I trade this pattern, and have found it to be pretty useful. If you learn how to trade it correctly, you might find that this price action pattern is pretty useful to you as well. What is a Morning Star Candlestick Pattern? A true morning star candlestick pattern is a bullish reversal signal, and therefore, only occurs after an established downtrend in price. Traders vary on what they consider to be a downtrend. Some require lower highs and lower lows, while others require only a short streak of consecutive lower candlesticks. Note: Steve Nison is the authority on candlesticks, and has created a proprietary method for defining a downtrend. Many of his courses go into these methods, as well as other qualifiers. I highly recommend Steve Nison for price action training. 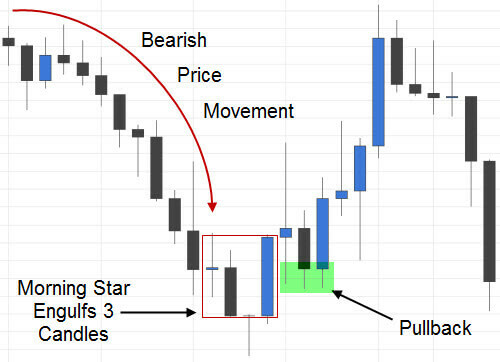 A morning star pattern, in Forex, is basically a variation of the bullish engulfing pattern. However, the second candlestick in this three-candle formation must be a low range candle, like a spinning top or doji (not required in a regular engulfing pattern). This pattern consists of a relatively large bearish candle, followed by a small real-bodied second candle that is either slightly bearish or a doji (since there are rarely gaps in Forex), and then a third candle who’s real body pulls into and closes past, at least, the halfway point of the first candle’s real body (see the image above). A non-Forex morning star is similar. The only difference is that, since most other markets gap quite often, the second candle needs to be isolated outside of the other two candles in the pattern. The second candle can have a small bullish or bearish real body, or it can be a doji. The second candle must not be an inside bar (or harami). The third candle, in a non-Forex morning star, should open at or below the first candle in the pattern. However, it should not engulf the second candle, but leave it isolated (see the image on the right). Note: Occasionally, in Forex, you will see a morning star that looks like a non-Forex morning star (except it will most likely have a slightly bearish second candle). If the third candle gaps up, and leaves the second candle isolated, this is a strong bullish signal. These cases are rare, but they can be very high probability signals. In the images above, the candlesticks of the morning star patterns did not have very long lower shadows (or wicks). The risk to reward ratio is best with this pattern when all the lower shadows are short, and the third candle in this formation closes just above the 50% mark of the first candle of the formation. Remember: Your stop should be placed one pip below the lowest low of the cycle. In a buy position, you do not have to include the spread cost into your stop loss positioning. The spread is added to your entry level. However, the morning star doesn’t always form with those ideal conditions, and that type of formation is not necessarily the highest probability signal that this pattern provides, either. In the image above, you will see a strong bearish price movement, followed by a morning star candlestick pattern. As I mentioned earlier, in Forex, the morning star usually looks like a variation of the bullish engulfing pattern. In the pattern above, the last candle of the pattern engulfs the previous three candles (nearly four). This is a strong bullish signal, but the length of the third candle has diluted the risk to reward potential on this trade (assuming you were planning on entering at the open of the next candle). To make things worse, the second candle in the morning star pattern was a dragonfly doji. The long lower wick of this doji means an even lower risk to reward scenario, yet it is a slightly bullish signal. This pattern would have actually worked out nicely any way you decided to trade it. They don’t always work out like this. If you would have entered at the open of the candlestick immediately following the morning star pattern, and placed your stop loss one pip below the lowest low, you could have still made a profit of about 2x your risk. However, there is another way to trade this pattern. The guy that first taught me how to trade the morning star would have waited for a pullback on this one. Occasionally, when the third candle of this pattern is relatively large, price will pull back into that candle. Like the pinbars, 50% of the total range of the third candle is a good target, or even 50% of the real body of that candle works well. If you would have entered the trade after price pulled back near the 50% mark of the outside (third) candle, you could have made more than 3x your risk. Note: The pullback does not happen every time a large third candle forms when trading the morning star candlestick pattern, or even most of the time. This is simply a technique to raise your risk to reward potential on a trade that you would have otherwise not taken. Watch for a rejection of price at the 50% area. I’ve said many times before than context is everything when it comes to candlestick signals. When taken after an established downtrend, trading the morning star candlestick pattern can be very profitable. Some traders use this pattern as their main trading setup. In Forex, the market doesn’t gap very often, especially when trading the major pairs. 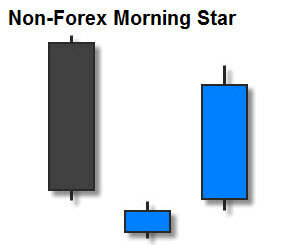 Consequently, the second candlestick in a Forex morning star pattern should be slightly bearish or a doji. The alternative leads to an inside bar, and a third candle with no relevance to the pattern. The third candlestick in this pattern needs to pull into and close, at least, in the top half of the first candlestick. However, the third candlestick can be larger, and it often engulfs the previous two candlesticks or more. When that happens, it is a strong bullish signal, although it necessarily lowers your risk to reward potential. I learned most of what I know about candlesticks patterns and price action trading from Steve Nison. He is the authority on candlesticks, and I would recommend his courses to any trader interested in a deeper understanding of them. As I’ve said before, I don’t usually take these candlestick patterns as trading signals by themselves, although many traders do so successfully. I prefer to combine these signals with a profitable trading system to qualify the best candlestick signals to take. Remember to demo trade, before trading the morning star candlestick pattern with your hard earned money. Happy trading! You can use these on any time frame because the fundamentals behind the formation are the same. I don’t personally trade anything higher than the daily charts because I’m not patient enough, but I have before and these techniques work fine.